The trend for anime movies is continuously on the rise. Today, a lot of people are desperate to stream anime movies online free, and so we are providing a list of the top best sites to watch anime movies online free for all categories. While there are lots of Anime movies streaming websites, these are the best ones. You’ll find so many animated films arranged into categories on these Anime streaming sites. This website is one of those right places to find exciting anime films you would be able to watch for free. It has an intuitive website interface and loads very fast on reliable internet connections. KissAnime is home to tons of animated movies arranged into categories for easy navigation. It is a website where you can watch English subbed and dubbed anime in clear HD resolution. You won’t only stream anime videos on this site, but also you will be able to watch dramas, play online games, and for quite other things; Kissanime is simply diversified. The name tells you that you’ll find some crazy stuff on this website. Yeah, this is an exciting anime website where you can watch various categories of anime movies for free. This website provides you with cartoons and dubbed anime from its extensive library. Full episodes of these movies are freely available for streaming in high-quality output. Most interestingly, you do not need to sign-up before accessing the videos on CatoonCrazy. You could bookmark this website and get back to it anytime you need to feed your eye with some cool cartoon or anime series. Now, you will not only stream anime movies but also you can download them and playback anytime later on portable media players. The 9anime website is free for everyone to get access to and watch interesting/intriguing anime films; episodes are equally available. Already, 9anime receives millions of daily users on its website; therefore, the site is consistently updated with new movies almost every hour. Also, you’ll be able to get the specific genres of anime you wish to watch using the “quick filter” option or navigate to the styles you want. 9anime s very light, user-friendly and there are so many animes to watch. Remember, you can download the animes on 9anime for further entertainment. This is simply one of the best places to watch free anime episodes and follows up new ones. It is a premium streaming platform and a home to hundreds of thousands of animated stuff. Every content on GogoAnime is available for free with no restrictions. On the GogoAnime website, it is straightforward to navigate and get out the kind of anime films to watch. Based on Alexa ranking, GoGoAnime is one of the most visited anime streaming websites on the internet. Well, it has a lightweight interface and loads very fast on all networks; thus, it should have a lot of users. You’ll never miss out one bit of every new anime movies and trailers when you bookmark and follow-up Chia-Anime. This is an excellent website for anime lovers; there is no anime movie you wish for that is not available on this website. Animes on chia-anime are arranged in alphabetical format; from A to Z. Thus, you can toggle to the letter which begins the name of the movie you’re searching for; then, it would be easier to get it out. However, there is a search button for you to enter queries and get out the movies you want immediately. Chia-Anime is simply perfect for streaming anime online, and its content is freely available. If you’re an addicted anime or manga lover, this is just your website. On AnimeFreak website you are presented with the best hand-picked, classy movies that are more than interesting to watch. Nevertheless, you will still see so many anime movies on this website. But for when your favorite anime is not on the homepage, use the search option to dig it out. There is never a time you won’t meet ongoing stories/movies on this site; therefore, you need to bookmark it and follow-up for endless entertainment on the movies you love. When it’s time to watch the “Big Guys” animes, the best streaming website to go to is anime-planet. This website hosts hundreds of thousands of premium anime films which allows everyone who is visiting the site to watch for free. Anime-planet has been around since 2001; it has a simple, easy-to-navigate interface with features that will help to improve your streaming experience on the site. For more engagement and to meet with other users of this anime streaming website, join the community. Definitely, for an anime lover, anime-planet is a nice place to stop and check out for new animes every day. If you’re looking for the best place to watch good anime shows and read up intriguing stories based on anime fiction, Crunchyroll is the place to go. This website has a cool, simple interface that everyone who visits the site won’t have issue navigating to its various categories. Also, Crunchyroll has over 25,000 episodes already available for streaming and about 15,000 hours of the latest/greatest anime series available. You’ll equally get a system that’ll help you discover new animes. Here is another premium, top-class website to watch anime movies freely. It houses premium, matured movies with real-like characters. Any grownup or teen anime lover will love this website. Plus, the user interface is quite friendly and easy to understand. Also, navigation on the site is straightforward. The animes movies here are available in hi-resolution output quality, providing you with an unmatched anime streaming experience. Of course, you can still stream anime videos on YouTube; it is a versatile video-hosting platform that houses at least up to 2 million or more anime videos. YouTube allows you stream HD videos with hi-quality sound output, providing you the best-in-class audio output quality. As one of Alphabet’s (Google) product, YouTube is 100 safe and secure to browse. However, you cannot download the anime series you find on this platform unless you use an online Youtube video downloader. 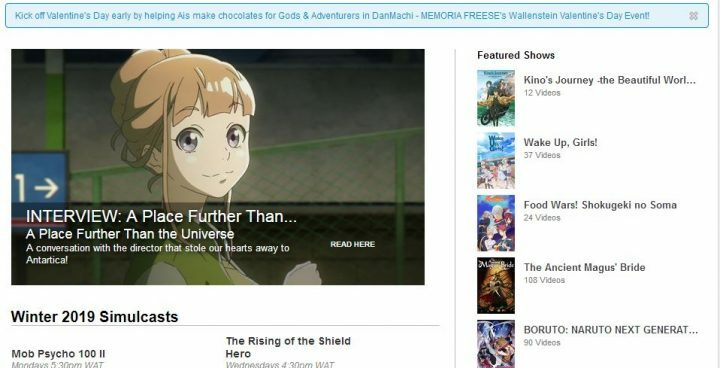 These are just ten out of the top best sites to watch anime movies online freely. They house hundreds of thousands of anime movies arranged into categories. You’ll find other good one’s asides these. However, the ten sites on this list are the top-rated and most commendable ones. I use (legit) AnimeLab, CrunchyRoll, and Funimation Now. You can get them all on your PS4 or through smart tv web browser. For pirate anime I use 9anime but apparently, kissanime is alright too. you can see that there are quite a few more. Some worth noting are The Anime Network, AnimeSols, Daisuki, Funimation’s own website, the ambitious Viki, and VizAnime.com (which is not on that list for some reason). To be fair, there is a considerable amount of overlap, as you will most likely see much of their content on Hulu or Netflix. In any case, there certainly are many options for legally watching anime online.